I was recently talking with brilliant folks over in the AppsLab and learned about the scavenger hunt they ran in coordination with the Oracle Development Tools User Group (ODTUG) at Kscope15, held recently in Florida. The scavenger hunt, being IoT focused and incorporating mobile and wearable technologies, peaked my interest as it drew parallels from where this is happening right on the ground (literally at Kscope15) to where it is, and will be happening soon, with Oracle Cloud product and services. Complete a task, many by having your NFC sticker (once provisioned) scanned by NFC readers hosted on Raspberry Pis using Java 8. But behind the work flow of the hunt was a great deal of work leveraging a wide set of technologies: APEX, Java, React, Node.js, REST, PL/SQL, Android, Raspberry Pi, NFC, REST and Twilio servers and more (for full details on how the scavenger hunt was implemented, read Noel Portugal's write up here). IoT Enabled Device Cost and Availability - Most readers of this blog are well aware of the ever widening array of IoT enabled devices available, so these next statements surely won't come as earthshaking news, they will provide a very current example. Anyway, to bring the point across: While I didn't ask the price, knowing typical shoestring show budgets and given the fact that every attendee had one placed on their badge, the cost of the NFC (Near Field Communication) stickers used in the scavenger hunt appeals to even my frugal nature. They can quickly be found and ordered online from any number of shopping sites and be delivered right to your door within two days or so. And that's just one of a growing myriad of affordable types of end devices and sensors that are readily available. Temperature, humidity, light, sound, and so on. Plus the ridiculously affordable Raspberry Pi can be used as a gateway device and/or to host various sensors and more (check out Mark Heckler's blog series involving these topics as he moves the management of his own renewable energy embedded systems into the Cloud). 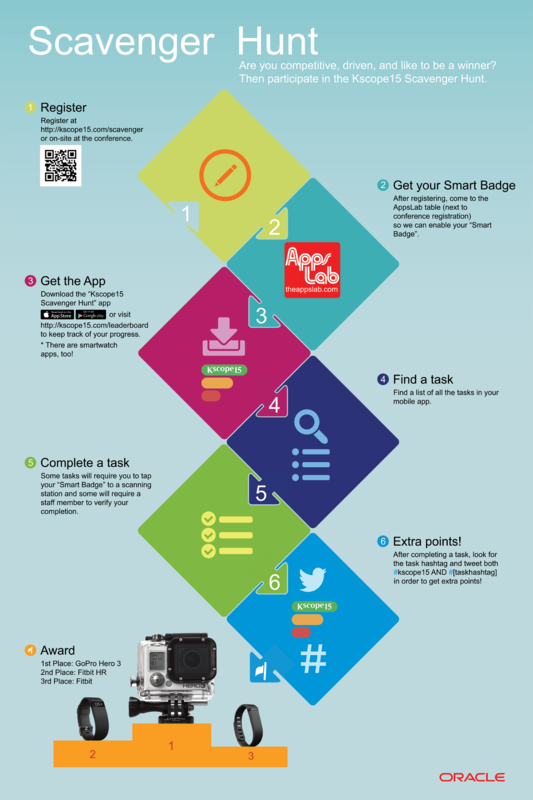 Virtually every step in the creation of the scavenger hunt that was done on premises, barring the physical requirements such as attaching the NFC smart sensor to the Raspberry Pi, is or soon will be something that can be accomplished in the Oracle Cloud. And, from above, Mark Heckler is creating another prime example of what just one man can do with Oracle Cloud and IoT technologies and IoT enabled devices that could eventually be leveraged into real world solutions providing value even at low scale. The Oracle Internet of Things Cloud Service is coming soon. Node.js Cloud Service is coming soon. Developer Cloud Service, Java Cloud Service, Oracle Database Cloud Service (complete with Oracle Application Express (APEX) as used in the scavenger hunt) and Integration Cloud Service are among the many that are generally available and thriving. In a very short period of time the convergence of Oracle Cloud Products and Services along with the Internet of Things as a whole will be, to harken back to a previous tag line, 'complete'. Full ALM in the Cloud; deployment in the Cloud; integration to Cloud services and On Premises solutions; gateways and end devices easily and securely connected. Simple. Integrated. Intelligent. (That's our new tag line, btw). The Internet of Things is here. And there. And soon to be anywhere an end device or sensor can be placed, verging on ubiquity over time. It's likely most of us are already garnering something of use from the Internet of Things, be that from a wearable or IoT enabled security system and/or climate control system. And while many of the creative-yet-'fluff'-appeal inventions in the IoT will quickly disappear as being as useful as the Pet Rock™, we will soon be finding ourselves benefiting in ways that will be superlative in nature as we are entertained, as we have more data to make wiser business decisions, and as we ultimately find our lives improved, extended or perhaps even saved. Eric Renaud is a Senior Outbound Product Manager at Oracle working on Cloud Developer Outreach for Oracle Cloud Product and Services, including the Oracle Internet of Things Cloud Service. Just previously at Oracle he worked in the Java Product Group as Senior Outbound Product Manager focused on Embedded and M2M. Prior to Oracle, Eric worked at CollabNet as a Community Manager and Open Source Software Methodology Consultant for large enterprises leveraging Agile ALM SaaS and IaaS solutions in the Cloud. follow us here in the Oracle Internet of Things blog.